A classroom dedicated to energy conservation runs on ethics, hard work, dreams, and a kid-powered bicycle. Editor's Note: Sharon Campbell retired after 23 years of teaching at Redwood Middle School. She recently presented on project-based learning at TEDx Philadelphia ED and is now working on writing a book about individualizing instruction. Sharon Campbell remembers sleeping out under the stars and watching Sputnik go overhead. Back then, she wanted to be the first astronaut. Instead, she became an educator. She has been teaching art now for twenty-one years at Redwood Middle School, in Napa, California, but she visits space on a regular basis, via a very special classroom. It began when Campbell won a grant from British Petroleum and went to Los Angeles for a workshop on energy conservation. She visited Southern California Edison, where she watched incoming energy switch throughout the state. "It was during the heat wave, and I sat and watched California run out of electricity," she recalls. It was there she learned that power is a finite resource, and that if every homeowner installed just one energy-efficient lightbulb, it would be enough to avoid a blackout for an entire year. "And that’s when the big bulb went off," she says. 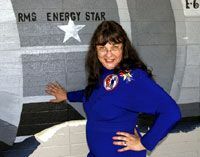 Campbell and her husband spent $14,000 of their own money to turn her classroom into the RMS Energy Star. Every summer and every Christmas, when her daughter Jacqueline comes to town, the family repaints the classroom. "I want it to be perfect, because my students deserve it," Campbell says. "They deserve to be in a beautiful place, to know that I want them to be here, and that the school values them." My classroom is a scenario-based trip to Mars. The kids come through the door, and they become crew members of the RMS Energy Star. I can control all the lights, the color of the lights, and even the temperature. Recently, we did our first field survey on Mars. We bathed the entire room in red light. I’ve been collecting bones for years; students examined these bones and determined what kind of life may have existed if these bones were found on Mars. As a self-contained unit in here, we have to supply the energy for our life-support system. Everything we do is energy conservation, and the kids love it. Last year was the first time the state infused our art program with enough money to rebuild a very anemic program. Without Governor Arnold Schwarzeneggger’s support, we just wouldn’t have a future in visual and performing arts in our classrooms. It can’t be all reading, writing, and arithmetic seven hours a day for eleven- and twelve-year-old students. 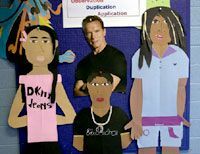 The way I see it, Arnold’s part of my classroom. Without his support, classes like mine will disappear very quickly. Top Secret Camouflage is paint. You can paint a flat surface and camouflage it as three-dimensional. We also have a fog machine. Every so often we have emergency drills -- because of asteroid hits, for example -- and the fog comes pouring into the classroom. Another one of our projects is building our own alien. We study the different planets -- the gravity, the atmosphere, and all the things that are important for a life force to deal with. Then the students create their own alien, so you might see a number of odd-looking critters around here. 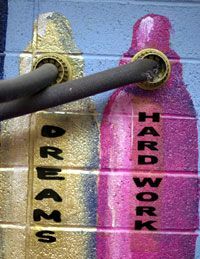 Painted on our wall is the juice that this class runs on: Success Fuel. It takes ethics, hard work, education, and dreams to get where we’re going. I've always said that if I could just harness the energy of certain eleven-year-old boys in my class, I could power the world. So my husband and I built a bicycle with a generator on it that my students pedal to power the classroom. We call it the Kid Power Bicycle. Every period, the first three students log in and spend five minutes on the bicycle. With fifteen minutes of pedaling by three students, we are able to create enough energy to run our computer, our electronic Promethean board, our sound center, and our interactive educational hardware. It's so wonderful because you have these antsy-pantsy, very kinetic young men, in particular, and they have to burn off that energy: Those that are coming in before and after school, those that are always first in line, love the idea that they have the ability to make electricity. The idea of empowering a student to make a change is what this is all about. It is magical. Harmful products can bite the dust. A wall-mounted computer monitor for your classroom. How can educators, students, schools, and communities go green? Find additional resources about sustainability, conservation, and other earth-friendly practices and curricula on Edutopia's Environment Education page.